Scientific name: Musa acuminata colla. Botanically, the fruit belongs to the family of Musaceae. Commercially, Banana is one of the widely cultivated crops in the tropical and subtropical zones. Banana is a perennial herbaceous plant that grows from the underground rhizome. 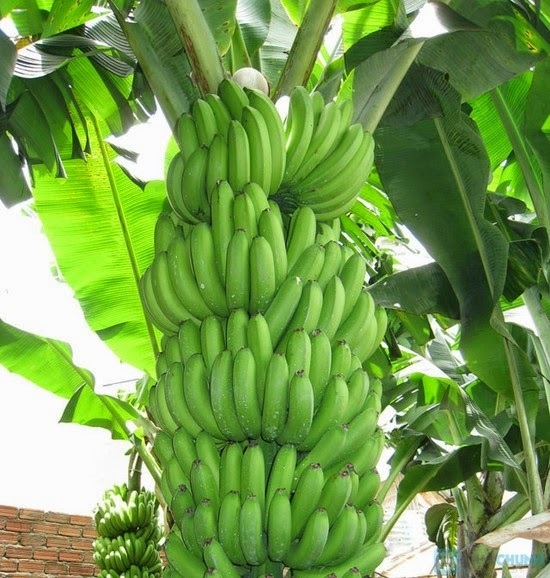 Banana flourishes well under tropical, moisture-rich, humid, low-lying farmlands. Banana has unique growth characteristics. In fact, the whole plant is a false stem (pseudostem). Its stem consisting of broad leaves together with their long petioles overlapping around each other in a disc-like fashion standing up to 2 to 6 meters tall from the ground surface depending upon the cultivar types. At maturity, the rhizome gives rise to a flower (inflorescence) that is carried up on a long smooth un-branched stem (true) through the centre of the pseudo-stem which finally emerges out at the top in between the leaf cluster. The flower subsequently develops to a huge hanging bunch, consisting of 3 to 20 hands (tiers), each with at least 5-10 fingers (fruits) in each hand (tier). There are several cultivars of banana comes in different sizes (4”-9”inch), color (yellow to brown), weight (70-150g) and taste. Structurally, it has a protective outer skin and delicious, sweet and tart, creamy-white color edible flesh inside. When ripened, the peel turns yellow. Banana can easily be peeled and eaten as it is. The fruit is sweet, and its texture soft, smooth, with a creamy yet firm pulp which is easy on digestion. Plantains are other cultivar types, more often known as cooking bananas. They are closely related to the familiar fruit banana or dessert banana. Plantains are used as a staple diet in Vietnam, Thailand, Laos, and other Southeast Asian as well as in many parts of tropical African and Caribbean regions. Today, bananas are grown in at least 107 countries and are ranked fourth among the world's food crops in monetary value. Bananas and plantains constitute a major staple food crop for millions of people in developing countries. One green cooking banana has about the same calorie content as one potato. Bananas are classified either as dessert bananas (meaning they are yellow and fully ripe when eaten) or as green cooking bananas. Almost all export bananas are of the dessert types; however, only about 10 - 15% of all production is for export, with the United States and European Union being the dominant buyers. 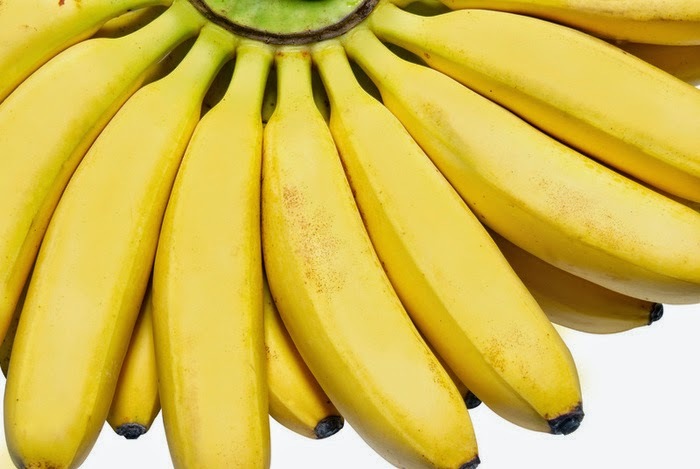 The possible health benefits of consuming bananas include lowering the risks of cancer and asthma, lowering blood pressure, improving heart health and promoting regularity. This is one of favorite fruits as it’s easily available, delicious, and most importantly, extremely nutritious. Bananas have very high content of potassium, a mineral that is essential to the normal muscular function, in both voluntary muscles (e.g. the arms and hands) and involuntary muscles (e.g. the heart and intestines). They are also a good source of dietary fiber, and low in saturated fat and cholesterol. This is also one of the few fruits which contain the entire range of vitamin B - thiamine (B1), riboflavin (B2), niacin (B3), folate (B6) and very little B5 and B12. Compared to an apple, Banana has four times the protein, twice the carbohydrates, three times the phosphorus, five times the vitamin A and iron, Vitamin C and twice all the other vitamins and minerals. Along with all the above, bananas also contain ample amounts of copper (to prevent graying hair), potassium, chromium, fluoride, manganese, riboflavin, niacin, selenium (to prevent pigmentation) and zinc. Bananas are sweet so they can help you replace your favorite sugary foods when you are trying to lose weight. They are also low in calories and contain soluble fiber that helps slow your digestion so you can consume less and feel fuller, helping you to prevent overeating. 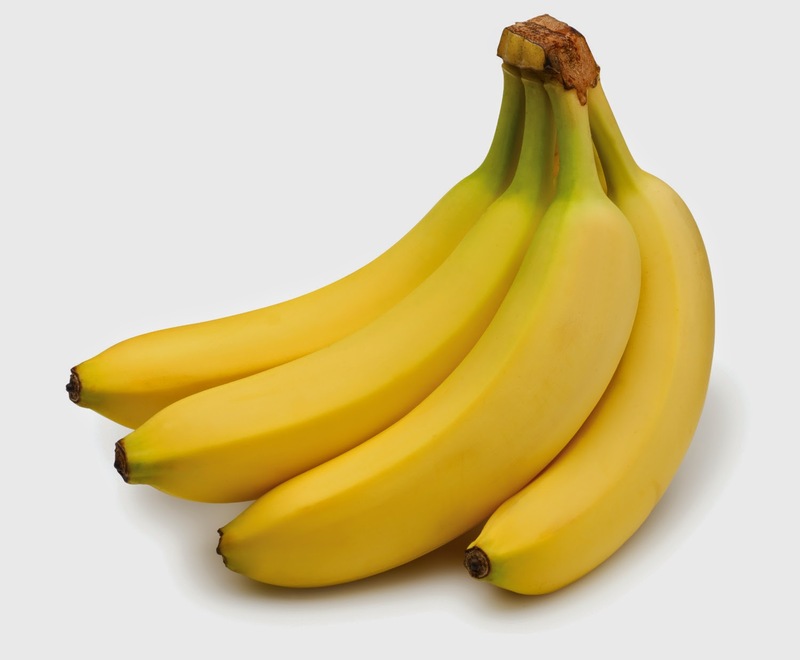 Bananas are a prime source of potassium which is absorbed into the bloodstream via the intestinal walls. This helps to dissolve fluid in the cells to keep your body's fluid levels balanced. If you begin to experience a potassium deficiency it can cause an irregular heart rhythm. 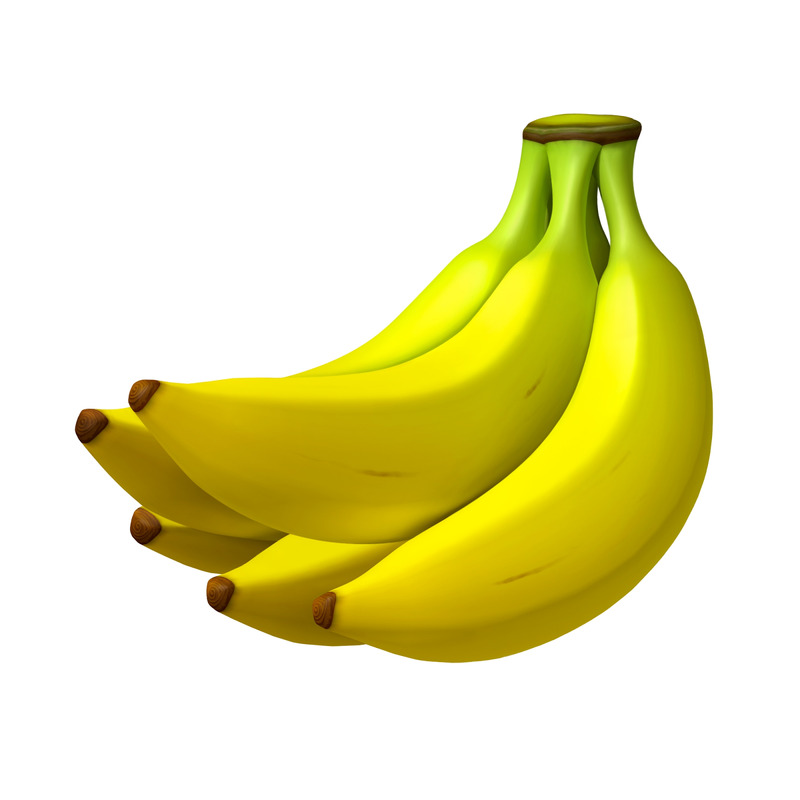 Eating a banana each day gives you around 2.5 grams of fiber which will help you move your bowels more effectively. You should get at least 14 grams of fiber for every 1000 calories you eat. Bananas can help you reach this goal more effectively. Bananas are a prime source of vitamin A and beta-carotene that can help you maintain your eye health. These compounds help to maintain the structures that bring light into the cornea so you can see more effectively. Men should take in 900 mcg of vitamin A and women should consume 700 mcg each day. Bananas contain tryptophan acid that can help boost your mood, reduce stress and help you manage depression more effectively. Bananas have a natural antacid effect in the body, so if you suffer from heartburn, try eating a banana to counteract the stomach acidity for a soothing relief. You can get a great deal of fiber when eating bananas. This can help you move your bowels more effectively to reduce digestive distresses like constipation. Bananas, particularly green bananas, also contain calcium that can promote healthy bones. They also contain a probiotic bacteria that can help your body absorb calcium more effectively. Consuming raw bananas can help address intestinal disorders by reducing acidity of the stomach and reducing stomach irritation. The pectin content in bananas is water-absorbent, creating the necessary bulk in easing constipation. Definitely a healthier choice over laxatives. Eat a ripe banana. It normalizes colonic functions in the large intestine by absorbing large amounts of water and helps regulate proper bowel movements. Bananas contain high amounts of iron and potassium that can increase your hemoglobin. This will help you combat anemia more effectively than some anemia medications can. Surveys have shown that people who eat a banana with breakfast, lunch and for a snack have more brain power and alertness throughout the day. Children that eat bananas daily have been shown to score higher in studies. Because of the high potassium and low salt levels in bananas, it is an ideal choice for those that are trying to lower their blood pressure. Bananas help you lower your blood pressure and provide plenty of potassium that can help you maintain balance in your body. This can help you lower your risk of developing a stroke. Many health experts claim that placing the skin of a banana on a wart with the yellow side facing out can help to kill off the damaged tissue. Use surgical tape to hold the banana skin in place to ensure the most contact possible. A deficiency in potassium can cause muscular cramps and greater susceptibility to injury. Make bananas a regular part of your diet if you exercise a lot, both for an energy boost and to prevent cramps and injuries. Getting enough potassium can help you regulate your heartbeat so you can get enough oxygen to your brain and maintain your water balance throughout the body. Banana helps keep our metabolic rate in check so you are less likely to feel the physical effects of stress. The magnesium, vitamins B6 and B12 and potassium can deduce nicotine content in the body. Those who are trying to break their addiction to nicotine can use bananas as a way to help them quit smoking. Rubbing a mosquito bite with a banana can help take down the swelling and itchiness in the area.